Digital health updates are written by LoneArranger, an anonymous industry insider. Digital health capabilities are increasingly becoming more integrated with core healthcare platforms and provider workflows, leading to major changes in the way healthcare is being delivered. There have been several recent developments in the application of technologies such as artificial intelligence, virtual and augmented reality, and wearable devices that have been disruptive, have the potential to change the practice of medicine and transform population health management and precision medicine. Innovations in areas such as mobile apps, the Internet of Things (IoT), machine learning, and artificial intelligence are being incorporated directly into healthcare applications. As the digital health industry moves into the next wave of innovation, the following areas are those that many healthcare providers, payers, vendors, and digital health startups are targeting for development. AI capabilities will become increasingly accepted and used by healthcare professionals as a clinical decision support tool to identify potential risks, mitigate errors, recognize patterns, and improve disease diagnosis and treatment. AI and Machine Learning will increasingly drive population health analytics, clinical decision support, and scientific research. This technology framework has the potential to allow hospitals, doctors, and insurance companies to share data more securely, assuming the role of a trusted gatekeeper. Using the concept of a shared ledger, it makes it possible to share information selectively with others. Digital records can be stored with variable access controls and digital assets can be exchanged with minimal friction. Organizations are expressing increased interest in the significant potential blockchain has for improving healthcare information management. A substantial amount of funding has gone into the study of genes as researchers and providers pursue new disease treatment options and patients seek more tailored and personalized healthcare plans. Pharmaceutical companies are leveraging genomics research to develop new medications for cancer and other serious conditions as well as other therapeutic compounds for advanced immunotherapy treatments. Many EMRs are now configured to maintain genomic data in the patient record, along with existing medical data, to provide a more complete picture for providers. The use of data from portable devices and sensors has given providers more real-time information on patient health status and patients the ability to have tailor-made strategies to combat illnesses and to take a more proactive role in managing their health. The connectivity of healthcare solutions and devices improves patient management, disease management, and the outcome of treatments. Since patients and providers both benefit from IoT, it will have a bigger presence and impact within the healthcare sector over time. The major shift in this area is the evolution from standalone applications to ones that are more tightly integrated with legacy healthcare platforms and the clinicians who use them. Apps that connect providers and patients are gaining traction. These are being used to help coordinate and manage patient care, increase patient engagement, and support more effective treatment of chronic disease conditions. As technology becomes more affordable, remote treatment options continue to grow in popularity for both doctors and patients. For the elderly and those living in rural areas, telemedicine provides increased access to healthcare services that otherwise might not be possible, from remote diagnostics and monitoring to medical education and outpatient services. Both public and private payers are also starting to provide increased reimbursement for telemedicine services and state laws are changing to remove restrictions and facilitate the provision of telemedicine services. The use of VR and AR technologies will expand in healthcare for medical education and training, surgical support, other types of decision support, and pain management. They can be used for simulation of scenarios, decision support for providers performing procedures, and distraction, education, and entertainment of patients. Behavioral health conditions are increasingly prevalent and challenging to treat. The insurance industry and self-insured employers recognize that the costs of treating mental health conditions, including depression, are increasing. Although long-term efficacy has yet to be demonstrated for most digital solutions, insurers and employers are increasingly willing to pay for digital behavioral health pilots. It is increasingly reimbursed by Medicare and investors are beginning to fund this sector. The hope is that more engagement and interaction, facilitated by digital technologies, may help patients with depression, anxiety, substance abuse, PTSD, and other behavioral health conditions. Chronic care interventions use a combination of health, behavioral, and contextual data – such as glucose levels, sleep patterns, weight, food consumption, activity, social factors, time of day, and weather — to improve patient treatment plans. Digital health tools can also be used to improve care team communication and coordination. These applications have demonstrated such compelling clinical efficacy that insurance companies are starting to pay for them because of improved patient outcomes at reduced cost. Pharmaceutical companies are also interested in integrating digital interventions with their drugs to improve outcomes, differentiate their products, and engage directly with patients. In the past few years, there has been a dramatic increase in the amount of digitized health data stored in EMRs and ancillary systems, fitness and health data captured from mobile devices and wearables, and genomic data. There are many potential uses for this explosion of new healthcare data. Insurance companies and companies that pay for employees’ health care directly can use additional data to help refine actuarial models. Physicians can use analysis of this data for diagnosis, quality improvement, and decision support. Patients may benefit from the mining of data for predictions of their propensity for acquiring certain health conditions. As a result, real-time alerts and guidance to patients and healthcare providers are becoming more feasible and useful. A recent and intriguing area of investment in digital health is in alternative insurance companies. These startups often compete directly with major industry players, which have also been exploring and deploying digital health solutions. However, these new insurance industry entrants have some advantages over the incumbents. These entrants are unencumbered by existing infrastructure and relationships and thus can establish tighter relationships with provider networks and provide more flexibility. They can also build their technology stack from the ground up which enables them to more effectively use digital health data and solutions to target specific, stratified patient groups. Their primary challenge is achieving sufficient scale and differentiation to compete effectively against the larger, more established payers. Digital technologies can help give time-constrained healthcare professionals the ability to see more patients in less time, while delivering a better patient experience, by using data analytics for decision support, more efficient workflow, and different forms of mobile communication and collaboration. Additionally, the cost curve can be shifted by leveraging less expensive resources. Given decision support tools, artificial intelligence, and data analytics, primary care physicians should be able to do some of the work specialists currently do. Nurses and case managers will be able to reduce a physician’s workload, and increasingly, patients will be able to manage their own care at home with mobile devices. Collectively, these new applications will dramatically transform the delivery of healthcare services. Google is the most active tech corporate investing in healthcare in the United States. Virtually all of its activity has gone through GV. CapitalG, Google’s growth equity fund, has made investments into Oscar Health and Practo Technologies while Google itself has co-founded Calico Life Sciences and acquired Lift Labs. Lift Labs develops a swiveling spoon that makes eating easier for patients with neurodegenerative hand tremors. Recent GV investments include everything from health insurance (Clover Health) to gene therapy (Fulcrum Therapeutics) to vaccine development (SpyBiotech). Google has not been shy about investing in therapeutics. In addition to Fulcrum Therapeutics, GV has made deals to Magenta Therapeutics, Spero Therapeutics, Arcus Biosciences, and Forty Seven all in the last year. Magenta is working on stem cell transplantation, Spero is focused on bacterial infections, and Arcus Biosciences and Forty Seven develop cancer immunotherapies. Once focused on lighting and electricity, the modern GE is a multinational conglomerate operating across many sectors. It is also one of the most active healthcare investors among US-based tech corporates. Recently, the company has made deals to HealthReveal, which monitors and predicts adverse health events, EMR data analytics company Arcadia Healthcare Solutions, and primary care provider Iora Health. The largest deal with GE Ventures participation was the $220M Series B of genome sequencing company Human Longevity in 2016. Apple has made very few investments in healthcare startups despite diving into the sector internally with services such as HealthKit, CareKit, and ResearchKit. Apple has made two recent acquisitions in the space, however. In August 2016, the company acquired Gliimpse, developers of a personal health data platform, and in May 2017 acquired Beddit, which developed a sleep monitor that tracks heart rate, breathing, snoring, and sleep quality. IBM has invested through both its corporate entity and the IBM Watson Group. While IBM Watson is an natural language AI platform, the company has made deals to both pharmaceutical and genomics companies such as Pathway Genomics (2014, 2016), Lodo Therapeutics (2016), and Petra Pharma (2016), and ApoGen Biotechnologies (2016). Amazon’s only healthcare investments in the past four years have been cancer diagnostics company GRAIL and baby monitoring startup Owlet Baby Care, the latter being backed by the Amazon Alexa Fund. Steve Rabuchin, VP of Amazon Alexa, has stated that the company will integrate Owlet with Alexa. In March of this year, Bezos Expeditions and Amazon participated in GRAIL’s $914M Series B. All of Intel’s investments in healthcare startups have gone through its venture arm, Intel Capital. The corporate entity has made two acquisitions in healthcare, Basis Science (2014) and IDesia (2012). Basis Science develops heart rate and activity monitors, while IDesia offers security identification technology based on a person’s unique heartbeat. Intel has participated in numerous rounds to both CareCloud and Sotera Wireless. CareCloud is a provider of cloud-based medical record and billing software, while Sotera Wireless develops wireless devices for in-patient monitoring of blood pressure, heart rate, oxygen saturation, and other biometrics. Facebook, Amazon, Microsoft, Cisco, and Oracle have all demonstrated limited private market activity in healthcare since 2012. Below are listed a few deals with participation from these corporate entities. In 2014, Facebook acquired Finland-based Protogeo, a developer of fitness tracking apps. Microsoft has made two healthcare deals since 2012, one from the corporate entity into Advanced Dental Cloud,and one through Microsoft Ventures to Livongo Health. Advanced Dental Cloud makes software for modeling dental implants and Livongo Health combines coaching and connected devices to improve diabetes management. Oracle has made one acquisition and one equity investment into healthcare startups since 2012. It acquired clinical trial management software provider ClearTrial in 2012 and participated in Proteus Digital Health‘s $45M Series F in 2013. Proteus has raised on four other occasions since then, with no disclosed Oracle participation. Cisco has made no equity investments in healthcare companies since 2012. The one deal shown on the social graph above refers to a grant made to Teslon in January 2017. According to CB Insights, funding this year has already reached over $1.5B spread across 18 deals. That’s already more dollars to the sector so far this year than in 2015. 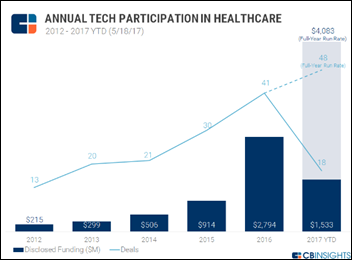 At the current run rate, 2017 is on track to reach $4B across 48 deals, a five-year high for tech corporates participating in deals involving healthcare startups. The historical and current participation of these companies in healthcare industry investments is summarized below. Healthcare is increasingly being impacted and disrupted by digital health innovations. The digital health sector has moved beyond the first wave of simple wellness devices and applications to integrated solutions from companies that are beginning to have a deeper understanding of how technology can be used to make healthcare more effective and efficient. Consumer companies such as Fitbit, Apple, and Samsung are beginning to partner with major payers, providers, and pharmaceutical companies. As shown above, major technology companies are also investing large sums in the healthcare sector to augment their existing products and support new strategic initiatives. Despite this shift, many experts agree that there are too many companies targeting the same narrow problems. Many digital health founders have come from the technology industry and try to solve a problem that they have personally encountered within the imperfect healthcare system, whether it is truly widespread or not. Others may have just graduated from college and have limited business exposure, let alone any healthcare experience, and don’t understand the relevant use cases very well. The entrepreneurs who research and fully understand the complexities of this industry — including the relevant use cases, current workflows, the needs of providers and patients, and who will ultimately pay for these innovations — will be far more successful. Regardless of what digital health product or services startups offer, they will need to demonstrate a real value proposition and generate some evidence that outcomes are improved, revenues are increased, or costs are reduced or no one will pay for their solution or expend time and effort trying to integrate it within their existing health IT infrastructure.